A cecilbuffington.com Blast From The Past . . .
Richard Nixon was hoping for a light-hearted, impromptu concert at the White House, but the Man in Black delivered a full-frontal musical attack on the president's ideology and policies. Johnny Cash was a man who spoke his mind, whether he was talking to a prisoner at San Quentin or the President of the United States. In July 1972, Cash sat down with Richard Nixon in the White House’s Blue Room. The country music superstar had come to discuss prison reform, and the media was present, eager to report the results. Nixon thought he’d break the ice, and asked, “Johnny, would you be willing to play a few songs for us?” If he’d left it at that, things might have gone differently. But Nixon added, “I like Merle Haggard’s "Okie From Muskogee" and Guy Drake’s ''Welfare Cadillac." Both songs were satirical expressions of right-wing disdain (though Nixon probably missed the satire) - the first for Vietnam protesters and hippies, the second for poor people who cheat the welfare system. With the leader of the western world held captive, Cash launched into “What Is Truth?” a song that championed the idea of youth and freedom, with a pointedly anti-war second verse. Nixon sat listening with a frozen smile. Cash continued the assault with “The Man in Black,” a song that explained how his fashion preference represented his solidarity with the oppressed, the sick, the lonely, and the soldiers (“Each week we lose a hundred fine young men”). Cash then capped off his mini-concert with “The Ballad of Ira Hayes,” about the plight of Native Americans, in particular one of the soldiers who raised the flag at Iwo Jima. Hayes returned home to be decorated, but couldn’t deal with the guilt he felt over surviving the war when so many of his friends didn’t. He drank himself to death. That must have been a long concert for the president, with reporters and photographers there to witness. Nixon had probably figured he was popular with Cash’s fans, so the two men would have a lot in common. But he obviously didn’t know the depth of Cash’s character and his empathy for the downtrodden. And Cash could’ve taken the easy route, and played hits like “I Walk The Line” or “A Boy Named Sue,” but he chose to confront Nixon with protest songs. Would any of today’s performing artists do something like that? 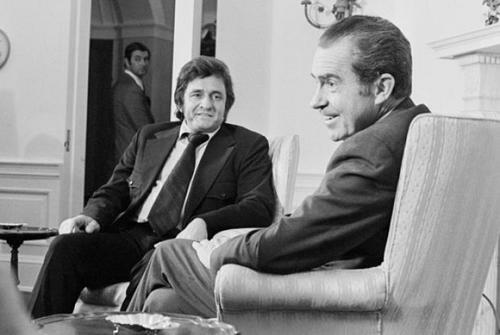 Johnny Cash, "The man in black" visits with President Richard Nixon in the White House in July of 1972.